Camarillo is a city in Ventura County in the U.S. 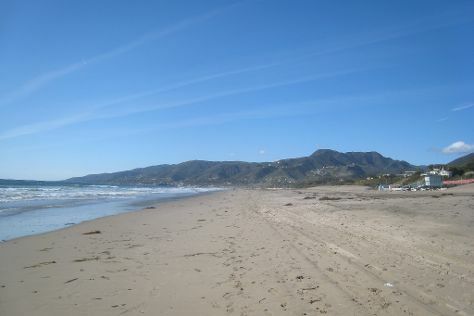 Escape the urban bustle at Zuma Beach and Paramount Ranch. Step off the beaten path and head to Tehachapi Depot Railroad Museum and Oxnard Beach Park. Get out of town with these interesting Camarillo side-trips: Ventura (Olivas Adobe & Dudley House Historical Museum), Ojai (Bart's Books, Beatrice Wood Center for the Arts, & more) and Malibu (El Matador State Beach & Paradise Cove). There's lots more to do: browse the collection at Ronald Reagan Presidential Library and Museum, look for all kinds of wild species at Carpinteria Harbor Seal Preserve and Rookery, revel in the low prices at Camarillo Premium Outlets, and examine the collection at Channel Islands Maritime Museum. For photos, ratings, other places to visit, and tourist information, you can read our Camarillo online attractions planner . In June, daytime highs in Camarillo are 75°F, while nighttime lows are 59°F. Wrap up your sightseeing on the 3rd (Wed) to allow time to travel back home.